Listeners were asked to evaluate whether a given amount of vibrato sounded natural. Hearing-impaired listeners seem to prefer a stronger vibrato than normal-hearing listeners. This concurs with previous findings indicating that hearing-impaired listeners have larger frequency-modulation detection thresholds, and that vibrato is expected in natural sounds. Natural sounds are full of large and small pitch changes, where vibrato belongs to the small pitch changes. The TFS1 test revealed that hearing-impaired listeners were unable to discriminate sounds with small pitch differences1. 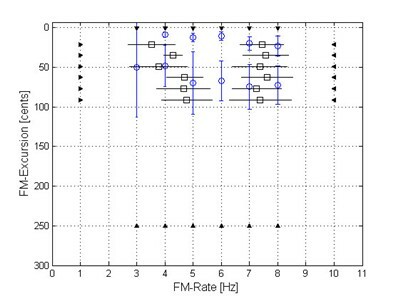 Consequently this study focused on whether hearing impairment affects the perception of small pitch differences appearing as vibrato. This study investigated the perception of vibrato rather than the benefit of vibrato. However, the interest was fuelled by an old, as yet unproven hypothesis2 that vibrato enables source segregation. The argumentation is that limited access to TFS implies limited access to vibrato, and thus impaired source segregation. There is also ample evidence that hearing-impaired listeners suffer more in difficult situations where source segregation is necessary. Despite many efforts, no experiments have as yet revealed any benefit from vibrato in source segregation3. The figure below, shows examples of stimuli. Using your mouse, place the cursor over the round boxes below and listen to the sounds. The vibrato is absent in the first example, and the pitch is constant. The second example represents normal vibrato. The third example of vibrato has a large excursion, where the vibrato is perceived as being too strong. The final example has a faster modulation rate, where the vibrato is perceived as being faster than natural vibrato. The grey box defines the boundaries of natural vibrato reported in Horii's review of the literature4. On average, vibrato parameters are outside this box will be perceived by normal-hearing listeners as unnatural. This content requires the Flash Player. Download Flash Player. Already have Flash Player? Click here. The stimuli were synthetic vowels with varying vibrato. The formant spectrum is equal to the 'O' vowel found in Chowning's micro-modulation sound example on Bregman and Ahad's auditory demonstration compact disc5. The fundamental frequency was 400 Hz, and the vowels consisted of the first 10 harmonics. The frequency modulation was applied as an equal amount of excursion (measured in Cents) to each harmonic component. For reference, +100 Cents correspond to a semitone, c.f. Wikipedia. with component amplitude ; pitch (Hz); frequency modulation rate ; frequency modulation excursion (Cents); frequency modulation noise (Cents); and noise signal. The frequency modulation noise is important, as it breaks the strict periodicity of the vibrato that listeners find mechanical. The individual compensation for hearing loss was achieved by matching loudness spectra obtained with the Oldenburg-Adaptive Categorical Loudness Scaling method6. The test paradigm was a one-interval-two-alternatives-forced-choice (1I2AFC). The boundaries were found with the aid of the one-up-one-down adaptation rule - starting with an extreme value that listerners would find unnatural. They heard a stimulus with the given amount of vibrato, and were asked to report whether it sounded natural or not. Answering ‘YES’ pushed the value towards the extreme starting value, while answering ‘NO’ pushed the value away from the extreme starting value. 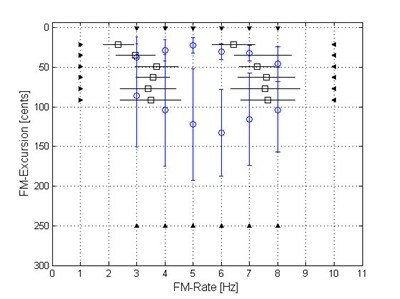 Figure 1: Average boundaries of preferred modulation rate and modulation excursion for normal hearing listeners (left) and hearing-impaired listeners (right). The black lines indicate rate-preference measurements obtained with constant excursion. The blue lines indicate rate-excursion measurements obtained with constant excursion. The black triangles indicate the extreme starting values. The number of participants was too low to draw a firm conclusion. Nevertheless, the results indicate that hearing-impaired listeners prefer a larger excursion than normal-hearing listeners. For the low excursion boundary this is in agreement with the findings that hearing-impaired listeners cannot detect frequency modulations as small as normal-hearing listeners. This suggests that hearing-impairment and limited TFS sensitivity could prevent listeners from utilising vibrato to separate sources in difficult situations. However, the question as to whether normal-hearing listeners do utilise vibrato in such situations remains uncertain. Vatti M, Santurette S, Pontoppidan NH, Dau T (2014). Perception of a Sung Vowel as a Function of Frequency-Modulation Rate and Excursionin Normal-Hearing and Hearing-Impaired Listeners. Journal of Speech, Language, and Hearing Research. Just Accepted, released May 13, 2014. 1 Moore, B.C.J. and Sek, A. Development of a fast method for determining sensitivity to temporal fine structure. International Journal of Audiology 48(4):161-171. 2009. 2 Sundberg J (1975). Vibrato and vowel identification. KTH Computer Science and Communication. Department for Speech, Music and Hearing, STL-QPSR 16 (2-3), p. 49-60. 3 de Cheveigné A (1997). Ten experiments in concurrent vowel segregation. ATR Human Information Processing Research Labs technical report, TR-H-217. 4 Horii Y (1989). Frequency modulation characteristics of sustained a sung in vocal vibrato. Journal of Speech and Hearing Research 32, p. 829-836. 5 Bregman AS, Ahad PA (1996). Demonstrations of Auditory Scene Analysis: The Perceptual Organization of Sound. MIT PRESS. 6 Brand T, Hohmann V (2002). An adaptive procedure for loudness scaling. Journal of the Acoustical Society of America 112(4), p. 1597-1604. This study was a master's project carried out by Marianna Vatti. 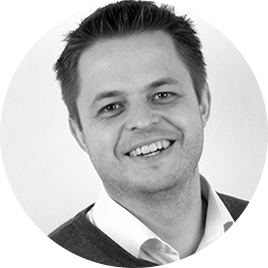 The supervisors were Torsten Dau and Sébastien Santurette from the Centre for Applied Hearing Research, DTU Elektro, and Niels Henrik Pontoppidan from Eriksholm.